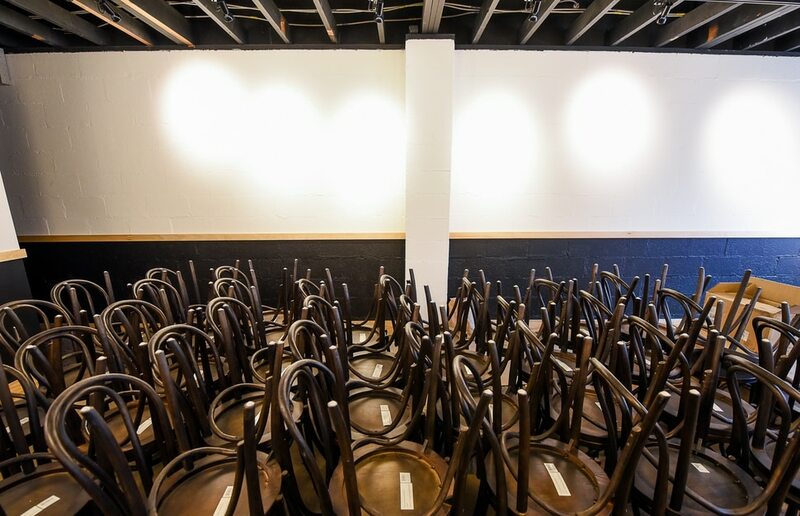 (Francisco Kjolseth | The Salt Lake Tribune) Chairs await their final placement at Stratford Proper, the fourth sibling in the Proper chain (along with Proper Brewing, Avenues Proper and Proper Burger) which opens Dec. 10 at 1588 E.Stratford Ave. It's located in the old Per Noi Italian restaurant space. (Francisco Kjolseth | The Salt Lake Tribune) Stratford Proper, the fourth sibling in the Proper chain (along with Proper Brewing, Avenues Proper and Proper Burger) opens Dec. 10 at 1588 E.Stratford Ave. It's located in the old Per Noi Italian restaurant space. 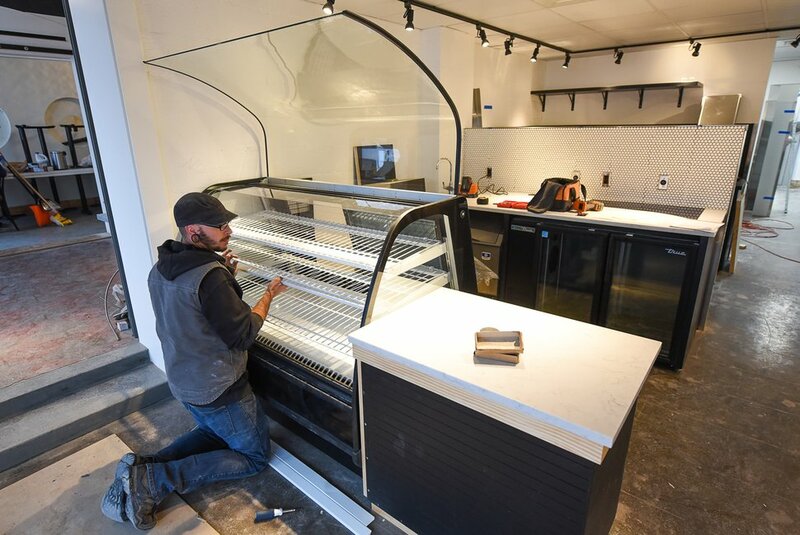 (Francisco Kjolseth | The Salt Lake Tribune) Cameron Isaac works on the final details at Stratford Proper, the fourth sibling in the Proper chain (along with Proper Brewing, Avenues Proper and Proper Burger) which opens Dec. 10 at 1588 E.Stratford Ave. It's located in the old Per Noi Italian restaurant space. (Francisco Kjolseth | The Salt Lake Tribune) Stratford Proper, the fourth sibling in the Proper chain (along with Proper Brewing, Avenues Proper and Proper Burger) opens Dec. 10 at 1588 E.Stratford Ave. It's located in the old Per Noi Italian restaurant space. (Francisco Kjolseth | The Salt Lake Tribune) Stratford Proper, the fourth sibling in the Proper chain (along with Proper Brewing, Avenues Proper and Proper Burger) opens Dec. 10 at 1588 E.Stratford Ave. It's located in the old Per Noi Italian restaurant space. 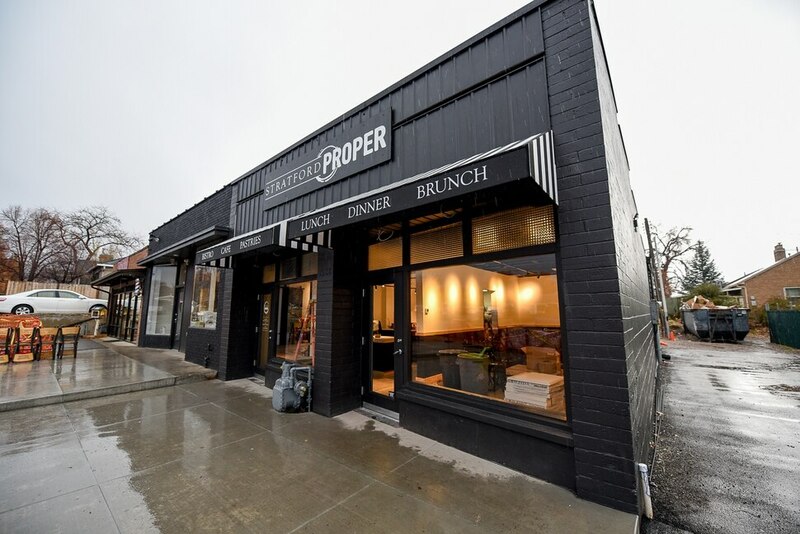 Salt Lake City will get a new neighborhood cafe Dec. 10 with the opening of Stratford Proper — the latest sibling in the Proper family of eateries. Stratford Proper, in the former Per Noi Trattoria Italian restaurant space, 1588 E. Stratford Ave. (about 2600 South), will be open daily and will serve a casual bistro menu that includes coffee and breakfast pastries in the morning followed by soups, salads, sandwiches and healthy bowls in the afternoon. Executive chef Jeffrey Springer’s dinner menu will include homemade pastas, hamburgers and pizzas, including vegetarian options. The restaurant also will be open for weekend brunch. Proper owners have spent months remodeling the building and updating the kitchen so fresh pastries and breads can be baked in-house. The exterior received a fresh coat of paint, a new black-and-white awning and an expanded patio, said Eleanor Lewis, marketing director of the company, which also includes Avenues Proper & Publik House, Proper Brewing Co. and Proper Burger. Stratford Proper recently received a full-service restaurant liquor license from the Utah Department of Alcoholic Beverage Control, allowing patrons to have beer, wine and spirits as long as they order food. (Francisco Kjolseth | The Salt Lake Tribune) Cameron Isaac works on the final details at Stratford Proper, the fourth sibling in the Proper chain (along with Proper Brewing, Avenues Proper and Proper Burger), which opens Dec. 10 at 1588 E.Stratford Ave. It's in the old Per Noi Italian restaurant space. Lewis said the company wanted Stratford Proper to be a restaurant — and not a bar like some of its other properties — because they wanted families with children to feel comfortable visiting. Stratford Proper also has taken over the space next to the restaurant, which was formerly Sweetaly Gelato, said Lewis. The space will offer a large space for events and private parties. Stratford Proper • 1588 E. Stratford Ave. (about 2600 South), Salt Lake City. Open Monday-Friday, 7 a.m. to 2 p.m.; Saturday-Sunday, 9 a.m. to 3 p.m.; and every day, 5 to 10 p.m., for dinner.